Is Religion Really A Good Thing? I used to think that religion was a good thing. After all, religion teaches values, morals, tolerance and a lot of virtues that make us function better as human beings. But I'm not so sure we need religion. Recently I was reading The Blind Watchmaker by Richard Dawkins, a well-known atheist. The book takes its title from the famous metaphor about how mankind came to be. Creationists who believe that mankind was designed by a higher power have long argued that if you put all the pieces of a pocket-watch into a box and shook it for a hundred million years, the pieces would never randomly come together to create a watch. You need a watchmaker to carefully put the pieces in the right place. Creationists then argue that since man is so much more infinitely complicated, there is no way mankind could come to exist without some higher power designing the infinitely complex system that's necessary for us to survive. When I began reading Dawkins' book, I was expecting not to like the author. He is an arrogant man, having written The God Delusion in which he claims to virtually prove that God does not exist. What struck me about his writing though was the incredible empathy he has for living things. In one section he writes passionately about what he considers the cruel act of boiling a live lobster and goes so far to say that if he were invited to a dinner party and the host planned to cook a live lobster, he would consider it his duty to ensure the lobster was prepared in a humane way. Not the way I would expect an atheist to act. Maybe we don't need religion to teach values. After all, when we incorporate religion in teaching values it will invariably lead us to moral ambiguity. Is it really a sin to miss mass on Sunday? Will you go to hell if you do? Is dancing really a sin? What about dietary laws? In this previous blog post, I told the story about my Dad because I wanted to share that religion has had a powerful and positive effect in my life. Still, I have to say that religion also has some bad effects also. Didn't the Spaniards use religion to justify the cultural genocide of the Mayan people? Wasn't "Manifest Destiny" a type of religious belief that allowed Caucasians to justify stealing land from the American Indian? And what about the children's crusades where huge numbers of children left their homes for a treacherous journey to reclaim the holy land, which resulted in thousands of children dying of starvation, exposure and disease? Is religion a good thing? I'm not so sure anymore. My parents divorced when I was 21. It was 1981, and when I came home on leave from West Point they told me they were ending their marriage. It was naturally difficult for me. It was the first really bad thing that ever happened to me. I remember thinking how sad it was that the two people I loved more than anyone in the world were going their separate ways. The divorce colored my relationships with women for years. I never could seem to date the same girl for very long. Without realizing it at the time, I was subconsciously sabotaging all these relationships as a way of protecting myself. If I never got married, I would never get divorced. It took many years for me to get over this. But it was much tougher on my father. He took it really hard. He told me later that he was actually considering suicide, but he didn't follow through for one reason: he didn't want to go to hell. Catholic Doctrine teaches that taking a life without justification is wrong. And that includes your own life. 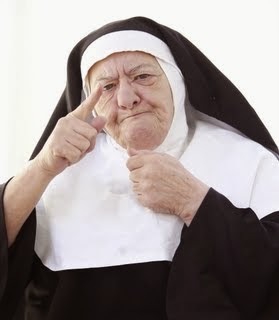 Some long deceased nun teaching grade school in Newport, Kentucky had taught a little boy in catechism class that taking your own life was wrong and you would go to hell if you did so. And that little boy was my father. Those lessons, fifty years later, still had a profound effect on him. I don't know if there is a hell, and I certainly don't know that if you take your own life you go there, but I'm thankful for that unknown nun who had no idea at the time that her teachings to a little boy would have a profound effect on many people's lives. Thankfully, he worked through this depressing time and we enjoyed him for another fifteen years before he died of natural causes. And he got to hold his beautiful granddaughter Jessica whose picture is above. Catholic Catechism may have saved my dad's life, but this does not mean it is correct. Catechism is made up of a large number of untestable theories. So the question for thinkers is if an untestable theory sometimes produces good results, should we embrace it? I am a Roman Catholic. I attended Catholic schools until I went to high school. I love my church with all it's imperfections. I am not a perfect Catholic and I have many questions about much of Catholic Doctrine. When I was a teenager and was thinking about what it meant to be a Catholic I read a book by a renegade priest who was having his own personal crisis with the church. While I don't remember the book or it's author in great detail, there are two stories however that are forever etched in my mind. One story was about a young man in his thirties, married with as many children as he and his wife thought they could afford, who went to confession every week to seek absolution for using contraception. Every week it was the same ritual. He would go and tell the priest, "Father, I used birth control two times this week." The priest would then absolve him of his sins and tell him to go and sin no more. And the next week they would do it again. The next story was about a young woman who also had as many children as she and her husband thought they could afford. They did not use birth control. Instead, her husband's way of preventing pregnancy was just to push her away. He didn't want to start anything he couldn't finish and was just afraid of what a little physical intimacy could lead to. What struck me then and still bothers me to this day was the enormous amount of human suffering that was caused by the Church's position on birth control. This is not to say the Church is wrong. I don't know that. Perhaps the benefit of the requirement out-weighs the cost. But in some Catholic families the requirement causes enormous difficulties. Others ignore the requirement, which leads to the ambiguity in defining what it means to be a Catholic. So as thinkers, what should we do when our religious doctrine requires us to act in a way that creates a lot of suffering for no apparent gain?